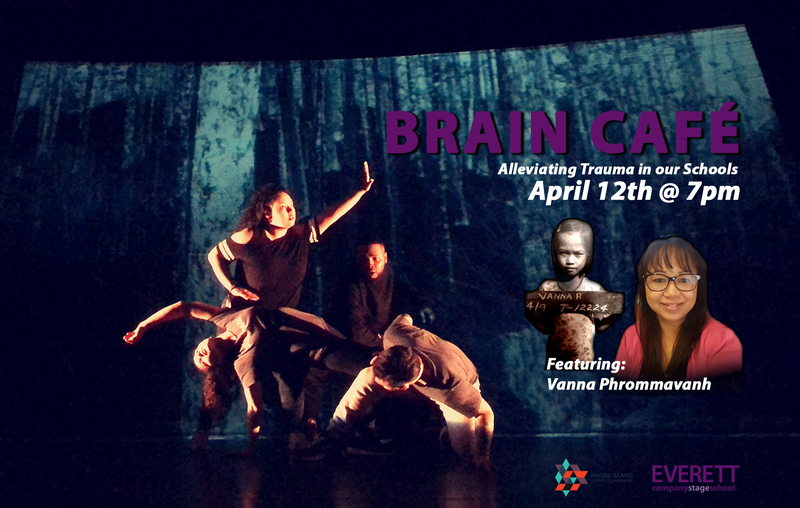 This Brain Café includes a presentation by Vanna Phrommavanh, a school-based clinician at the Providence Center. Vanna grew up in war-torn Laos, escaping to a Thai refugee camp before coming to America. Drawing on these experiences, she now helps trauma-impacted youth in Providence’s most challenged schools. In addition to Vanna’s presentation, Everett artists will perform personal stories of their own trauma. These stories help youth in schools gain the courage to share their experiences. These short presentations will be followed by a dialogue with the audience around the issue of trauma in schools. The evening shares the work of the Building Trauma-Sensitive Schools initiative (BTSS). A partnership between the Providence Children and Youth Cabinet, the Providence School District, the Providence Center, RI Student Assistant Services, and Everett, the initiative is designed to improve outcomes for trauma-impacted youth in our schools. Clinicians and artists work together, incorporating theater into an evidenced-based clinical trauma program. This Brain Café series is part of Everett Company’s research and development process in creating a new work, entitled Good Grief. Brain Cafés have been made possible through major funding support from the Rhode Island Council for the Humanities.